Here’s the story: Back in 1966, the world was given the gift of the Monkees. The so-called “Pre-Fab Four” (Micky Dolenz, Davy Jones, Michael Nesmith, and Peter Tork) were assembled by a pair of producers (Robert Rafelson and Bert Schneider) for a wacky NBC television sitcom, though in time they became a functioning real-life band. The Monkees sang “I’m A Believer,” “Daydream Believer,” and many other songs that didn’t involve the word “believer.” Davy Jones did that little shimmy dance that Axl Rose would later crib. Nez co-wrote “Sweet Young Thing” and generally ruled. Micky had a great voice and a great head of hair. Peter was funny. The Monkees would go on to become a beloved and enduring bit of ’60s pop-culture. They kind of ruled. Here’s another story: Back in 1986, as the Monkees were enjoying an unexpected resurgence and re-appreciation (thanks to an MTV Monkees marathon), Rafelson and Schneider—along with producer Steve Blauner—cooked up an idea to create a new Monkees group called, well, the New Monkees. 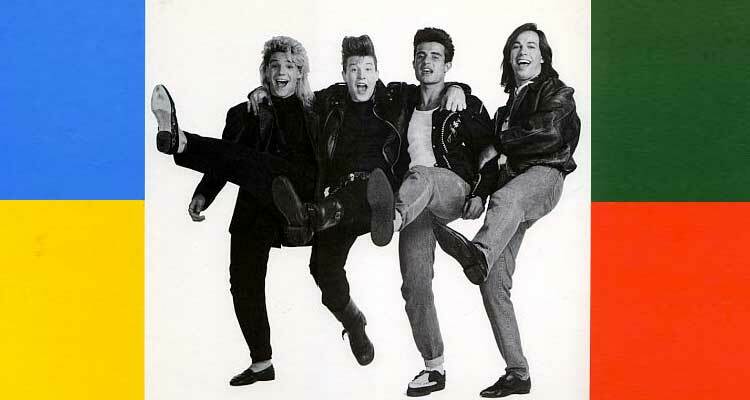 Jared Chandler, Dino Kovas, Marty Ross, and Larry Saltis were eventually selected from more than 5,000 applicants for the amped-up ’80s group. Similar to the original Monkees, the New Monkees were assembled mostly in service of a TV show—albeit one with an aesthetic somewhere between Pee-wee’s Playhouse and the opening credits of Saved By The Bell. Also similar to the original Monkees, the New Monkees were positioned to become a beloved and enduring bit of pop-culture. Hit records and films would surely follow. The kids would love them. They would rule. The New Monkees did not rule. The New Monkees, in fact, failed miserably. Monkees fans hated the New Monkees. New fans didn’t materialize. The TV show ran for 13 forgettable episodes, and the band released one forgettable album. Everyone agreed it was a weird, terrible idea. On a scale of misguided and forgotten ’80s creations, the New Monkees ranked somewhere between New Coke and that Alan Thicke talk show, Thicke Of The Night. And now, another story: One of the New Monkees was from Milwaukee. Yes, future New Monkees bassist and singer Marty Ross (far right in the above photo) was first a member of the beloved Milwaukee power-pop band The Wigs. Originally from Eugene, Oregon, Ross moved to Milwaukee during his first year out of high school and soon joined the fledgling Milwaukee group. The Wigs enjoyed regional success, released one album (1981’s File Under: Pop Vocal), and eventually relocated to Los Angeles after being picked up by CBS Records. When Ross left to join the New Monkees in 1986, the Wigs rebranded themselves as the 57 Braves. As the oldest member of the NEW MONKEES, Coca-Cola Telecommunications’ new half-hour, first run syndicated series, Marty Ross, 28, sees himself as a leader of men. The problem is, Marty usually leads these men straight into trouble. Fellow band members Dino, Jared and Larry still tend to look up to Marty, not only because he is more worldly and experienced, but because he exudes the most confidence around girls. What they don’t realize is that, although Marty seems to “know it all,” underneath that brash exterior is a very soft heart. In addition to his interest in girls, girls, girls, Marty loves to collect bizarre works of fine art and rare, unusual toys. But nothing is as important in Marty’s life as his music. Music has always been his means of expressing himself. The first thing you’re likely to notice about the cast of “The New Monkees,” an ’80s version of the ’60s television series “The Monkees,” is hair—billowing acres of it, towering thunderheads of hair. • The name “New Monkees” was originally a placeholder, and Ross and the band were just as surprised (and dismayed) as anyone when they found out is was the final name. • One of the auditions for the New Monkees was held on the set of The New Gidget, which was also a thing. • One of the final people Ross edged out for a spot in the New Monkees went on to form the Blue Man Group. These days, Ross lives in Los Angeles and plays with a new band, the Prairies Hermits. He returned to Wisconsin in 2013 for a Wigs reunion show at Shank Hall, and made an appearance with the group at Summerfest in 2014. The New Monkees, meanwhile, reunited for an acoustic performance in 2007. They remain a strange, fitfully remembered, and fitfully Milwaukee-related oddity. Hey, hey, they were the Monkees. Sort of.